"We are honestly not against the Jews. No. The Jews, the Christians, the Muslims - for us they are equal... The holy sites will remain open to the three [monotheistic] religions at all times, and no one can prevent anyone- Christian, Jew, Muslim - from going and performing his religious rituals." "The Al-Aqsa [Mosque compound, includes the Temple Mount] is ours... and they [Jews] have no right to defile it with their filthy feet." "We have to prevent them, in any way whatsoever, from entering the Sanctuary (i.e., the Temple Mount)... They have no right to enter it. They have no right to defile it. We must prevent them. Let us stand before them with chests bared to protect our holy places." 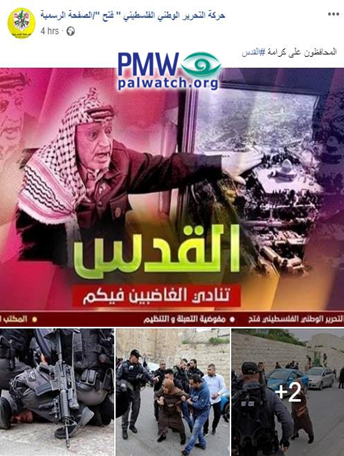 The fact that Palestinian Authority leaders, including PA Chairman Mahmoud Abbas, often convey contradictory messages - one message when talking to Palestinians and another message when talking to international audiences - has been highlighted repeatedly by Palestinian Media Watch. A recent statement of Abbas emphasizes this policy of deception. Regarding East Jerusalem, we will say that East Jerusalem is the capital of Palestine, West Jerusalem is the capital of Israel, and between them is a kind of cooperation. But the holy sites will remain open to the three [monotheistic] religions at all times., And it will be forbidden to prevent any person - Christian, Jew, Muslim - from going and performing his religious rituals." 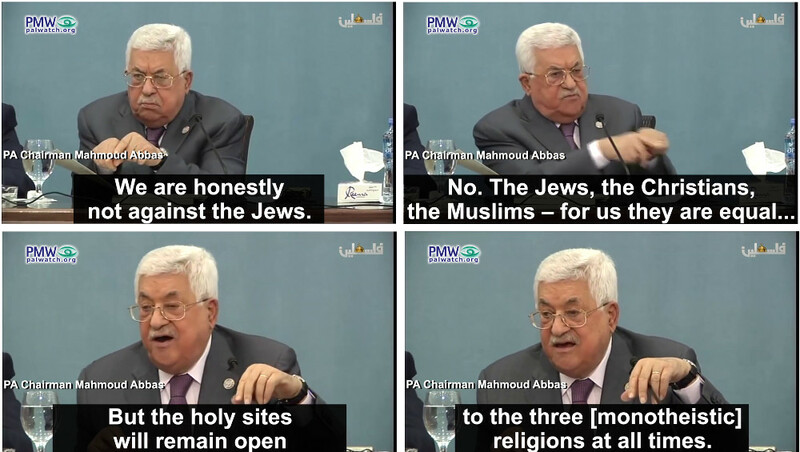 This directly contradicts previous statement made by Abbas, in which he explicitly called for Palestinian violence to prevent Jews from going to Judaism's holiest site - the Temple Mount. Abbas said he blessed "every drop of blood spilled for Jerusalem" and added that the Al-Aqsa Mosque, which the PA claims includes the entire Temple Mount, belongs to the Muslims alone, and which the Jews "have no right to defile with their filthy feet." "We bless every drop of blood that has been spilled for Jerusalem, which is clean and pure blood, blood spilled for Allah, Allah willing. Every Martyr (Shahid) will reach Paradise, and everyone wounded will be rewarded by Allah. The Al-Aqsa [Mosque] is ours... and they have no right to defile it with their filthy feet. We will not allow them to, and we will do everything in our power to protect Jerusalem." Significantly, no Jews at this time were entering the mosque itself or even requested to do so. Abbas wanted violence to prevent Jews from going to the Temple Mount. "The blessed Al-Aqsa Mosque - which sits on 144 dunams (i.e., approximately 35.6 acres) that are surrounded by walls, and includes 200 structures - includes the Southern Mosque (i.e., the Al-Aqsa Mosque itself), the Dome of the Rock Mosque, the madrassas (i.e., Islamic religious schools), the dome structures, the stone platforms, and others, and everything that is connected to the walls from the outside; it is an Islamic mosque that belongs to the Muslims only." "We must all carry out Ribat [religious conflict] in the Al-Aqsa Mosque... We have to prevent them, in any way whatsoever, from entering the Sanctuary... They have no right to enter it. They have no right to defile it. We must prevent them. Let us stand before them with chests bared to protect our holy places." "Al-Habbash condemned the use of the term 'Temple Mount' in the statement by the European Union (EU)... 'This [EU] statement, which contains false and misleading terms, constitutes a provocation of the sensibilities of hundreds of millions of Muslims throughout the world, for whom the Al-Aqsa Mosque is a part of their faith and their spiritual capital...'"
"That the EU reexamine this statement, avoid harming the Palestinian people's rights, and retract this term that inherently implies recognition of the occupation state's right to Jerusalem's Noble Sanctuary - to which the Palestinian people and its leadership firmly object." Storming of the Mercy Gate compound - "Al-Aqsa Mosque belongs to the Muslims only"
In addition, and contradicting Abbas' mollifying overtures to the Harvard students, the recent PA-supported storming of the Mercy Gate compound demonstrates the true nature of the PA approach, and underscores the PA's antisemitic policies in rejecting Jewish rights on the Temple Mount. On February 18, 2019, Muslims stormed the Mercy Gate, an area on the Temple Mount that had been sealed off by an Israeli court order after being used by Hamas and the banned Islamic Movement to teach hatred and incite violence. "We have warned the occupation time after time that the blessed Al-Aqsa Mosque belongs to the Muslims only, and that the steps of escalation against the Al-Aqsa Mosque harm the sensibilities of the people of Jerusalem." "The attack that the occupation state committed against the Gate of Mercy is a war against Islam, and that the State of Israel is playing with fire because it is deluded that the Palestinian people, with all of its religious and social elements, could submit to any step by the occupation at the Jerusalem Noble Sanctuary." "Our people will defend the blessed Al-Aqsa Mosque with what is most precious of all to it, and no one will ever have sovereignty over it except the Palestinian people. These steps will never pass and we will not accept them, regardless of the price... the Arabs and Muslims [have] to act to save Jerusalem, the Al-Aqsa Mosque, and [Jerusalem's] Islamic and Christian holy sites." "The Al-Aqsa Mosque with all of its plazas, facilities, and mosques, and what is above and below the ground that spread over 144 dunam (i.e., approximately 35.6 acres), including the Gate of Mercy Mosque, belongs to all of the Muslims and is an Islamic waqf (i.e., an inalienable religious endowment in Islamic law) to which no non-Muslim has any right..."
"The blessed Al-Aqsa Mosque, with all of its mosques, domes, plazas, and courtyards, aboveground and underground, is entirely Islamic, and any interference in its affairs by non-Muslims is illegitimate." "The Al-Aqsa Mosque will remain an Islamic mosque in spite of the haters and the aspirations of the greedy, and that neither the occupation nor any power in the world can change the description of this mosque that belongs solely to the Muslims." "The Jerusalem Noble Sanctuary (i.e., the Temple Mount) with all of its parts, including the Al-Buraq Wall (i.e., the Western Wall of the Temple Mount) and Plaza and the area of the Gate of Mercy, is a pure Islamic heritage, despite all of the occupation's attempts to take control of it and carry out its Judaization plots in the holy city." "Muslims alone have an absolute right to the blessed Al-Aqsa Mosque, and they must visit it in order to protect it from the desecration by the occupation and the settler associations." "Fifty-six settlers invaded the blessed Al-Aqsa Mosque yesterday [March 28, 2019] from the Mughrabi Gate... and listened to explanations about the myth of the alleged 'Temple' during their provocative tours, before leaving the blessed mosque." 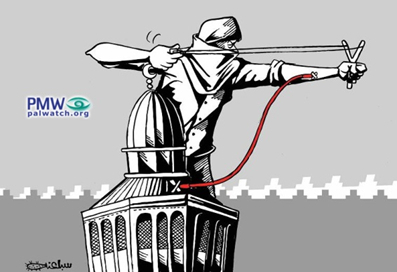 Supporting, and even fuelling the violence, the official PA daily published a cartoon that shows a masked rioter standing next to the Dome of the Rock and aiming a slingshot. An intravenous tube connects the rioter's arm to the Dome of the Rock, indicating that he is willing to give his blood for Al-Aqsa. "The blessed Al-Aqsa Mosque is a tenet of faith and place of worship of the Muslims alone, and that the [Gate of] Mercy structure (i.e., on the Temple Mount) and mosque are an inseparable part of the blessed Al-Aqsa Mosque's houses of worship." "The [PA] Presidential Office yesterday [Feb. 27, 2019] condemned the series of incessant Israeli attacks, invasions, and provocations. This was expressed by the settlers' invasion of the blessed Al-Aqsa Mosque, and prime among them extremist Israeli Parliament Member Yehuda Glick..."
"Fatah is encouraging all the sectors of our people to carry out Ribat (i.e., religious conflict/war over land claimed to be Islamic) and stand firm at the plazas of the Al-Aqsa Mosque and the Gate of Mercy, and to continue to stand against the Israeli occupation and its settlers and their recurring invasions of the Al-Aqsa Mosque." On March 12, 2019, Muslim worshippers threw a Molotov cocktail at the Israeli police post on the Temple Mount causing a fire that damaged the building and set a police vehicle on fire. Following the attack, the police closed the Temple Mount to visitors, removing those already there. Israeli Police reported that in a search carried out after the Temple Mount was closed they found incendiary materials, firecrackers, and Molotov cocktails. "The Al-Aqsa Mosque is a red line, and ... Jerusalem, with all that is within it, is purely Palestinian... the abuse of the holy sites, and especially the blessed Al-Aqsa Mosque, is a direct call for violence, and... we in Fatah will not allow the execution of the Israeli plan, whatever the cost may be..."
Posted text: "A blessing of honor and admiration to the men and women carrying out Ribat (i.e., religious conflict/war over land claimed to be Islamic) in Jerusalem. You are the nation's glory and the first line of defense for our cause and our holy sites." The image shows Muslim women in front of the Dome of the Rock on the Temple Mount. 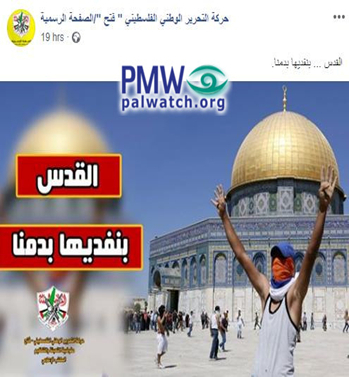 Text under Fatah logo: "Information Office of the Fatah Movement Mobilization and Organization Commission"
Text at top of image: "Jerusalem is a red line"
Posted text and text on image: "We are redeeming Jerusalem with our blood"
The image shows a masked Arab rioter holding his hands in the air in front of the Dome of the Rock on the Temple Mount. Posted text: "The guardians of Jerusalem's honor"
The image shows former PLO and PA Chairman Yasser Arafat gesturing to a picture of the Temple Mount. Text on image: "Jerusalem is calling to those among you who are raging"
Text on bottom of image: "Information Office of the Fatah Mobilization and Organization Commission"
While Abbas attempted to deceive the visiting Harvard students claiming that if the PA controlled the Temple Mount it would allow true religious freedom for all three monotheistic religions, the almost daily statements by the PA and its officials clearly expose this deception. The true PA policy is that the entire Temple Mount, and the central place of Jewish worship - the Western Wall - are purely Islamic. Were the PA to have control of Jerusalem, Jewish presence on the Temple Mount and the Western Wall would be prohibited as "invasions" and "desecrations" of Islamic sites. Note: Abbas' speech from 2014 originally aired on official PA TV on Oct. 17, 2014 and was broadcast a total of 29 times that month. It was also broadcast 3 times on Nov. 1 and on Nov. 4, 2014, and once on Nov. 11, 2015. 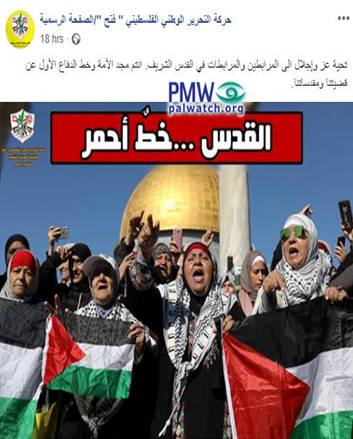 It was posted on the official Fatah Facebook page on July 15, 2017 and on Nov. 28, 2018. An excerpt of Abbas' speech was broadcast on the official PA radio station The Voice Of Palestine and on PA TV (with different background footage) dozens of times in in Dec. 2017 - 2018, most recently on April 3, 2018. EU Heads of Mission in Jerusalem and Ramallah met with members of the Jerusalem Islamic Waqf Council. The diplomats were briefed about recent developments at the Haram al-Sharif/Temple Mount. The EU is concerned about worrying developments and violent clashes at the Haram al-Sharif / Temple Mount. The EU reiterates the importance of upholding the Status Quo for the holy sites in Jerusalem, including with regard to Jordan's special role. Any unilateral attempt to change the Status Quo could have deeply destabilizing effects. The EU calls on all actors on the ground and in the wider region to show calm and restraint in order to prevent any escalation, and to work towards restoring the dignity and safety of this holy site. The diplomats encourage continued dialogue between the parties to ease the tensions at the Haram al-Sharif / Temple Mount. The EU position on Jerusalem remains unchanged: the aspirations of both parties must be fulfilled and a way must be found through negotiations to resolve the status of Jerusalem as the future capital of both states." Headline: "Al-Habbash condemns the fact that Jerusalem's Noble Sanctuary was called 'the Temple Mount' in the European Union Mission's statement"
"Supreme Shari'ah Judge of Palestine and [PA] President [Mahmoud Abbas'] advisor on Religious and Islamic Affairs Mahmoud Al-Habbash condemned the use of the term 'Temple Mount' in the statement by the European Union (EU) Heads of Mission in Jerusalem as a name to indicate the blessed Al-Aqsa Mosque (referring to EU press release on March 21, 2019; see note below -Ed.). In a press release today (Monday) [March 25, 2019], Al-Habbash said that the Palestinian leadership condemns this phrasing. He said that this is a blatant violation of the international decisions, and especially [those of] UNESCO - the UN Educational, Scientific, and Cultural Organization - which has published a number of decisions that emphasize that Jerusalem and Jerusalem's Noble Sanctuary are Islamic and that view them as a purely Islamic cultural heritage to which those who are not Muslims have no right. Al-Habbash demanded that the EU reexamine this statement, avoid harming the Palestinian people's rights, and retract this term that inherently implies recognition of the occupation state's right to Jerusalem's Noble Sanctuary - to which the Palestinian people and its leadership firmly object." Mahmoud Al-Habbash also holds the position of Chairman of the Supreme Council for Shari'ah Justice.